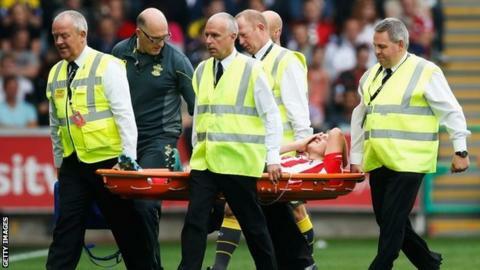 Southampton midfielder James Ward-Prowse has been sidelined for 10 weeks with a fractured foot. The 19-year-old suffered the injury during the second half of Saturday's win at Swansea. "We're very disappointed, but that's football and that can happen," Koeman said. "It's unlucky but OK.
"The boy has to keep going and it's difficult because he had a great start to the season, but it's part of the football and he will come back." Up until the injury, Ward-Prowse had played for Southampton in every fixture this season. Meanwhile, Koeman said that another young English player, Nathaniel Clyne, should be called up by the national side. The 23-year-old scored Southampton's second in their 2-1 win at Arsenal in the League Cup, with a brilliant 35-yard strike. "I think he's ready [to play for England]," Koeman said of Clyne, who has played at under-19 and under-21 level. "He has a lot of experience, he is playing very well from the beginning of the season. "He scored a great goal. I think his performance was very good and I think it's an option for the national coach and I'm very happy to have Clyney in our team because he brings a lot of experience. "He brings a lot of spirit and I like to have and play with offensive full-backs. He shows that quality and it's very important for the team."